Elizabeth King: The Sizes of Things in the Mind's Eye opens, November 8 at the David Winton Bell Gallery, Brown University. "King makes meticulously crafted objects that draw our attention to the nature of being and the interplay between life and artifice," says the director of the gallery, Jo-Ann Conklin. Malcolm Grear Designers created the exhibition's identity, invitation, and signs/panels. 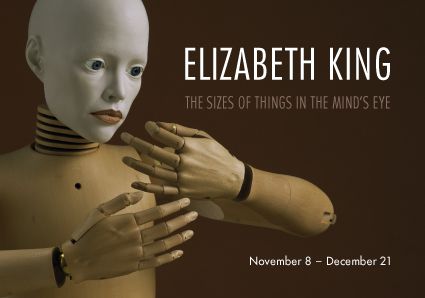 Elizabeth King: The Sizes of Things in the Mind's Eye opens on November 8 and continues until December 21. On November 7 at 5:30 pm the artist will lecture with the reception to follow. For more information on the exhibition please visit the David Winton Bell Gallery . Read the Providence Jounral's review of the exhibtition.